This well-known story by an unidentified author teaches us a great lesson. If you begin each task with the end in mind, you’ll find motivation and meaning in even the most difficult or mundane activities. Before you start a project, an exercise routine, or even your daily activities, you will do well to define what you expect the end result to be. Envisioning the end when you’re still at the beginning can sometimes be a challenge—especially at the start of a new year. But if you follow these four steps, you’ll discover the big-picture view of your life and your goals. That will make it much easier to begin your activities with the end in mind. Determine what matters most in your life. It wouldn’t take long for you to create an extensive list in your planner of all the things that make you tick—the people, places, and activities that bring you the most joy. Once you have that list, consider how much time you spend with each of your most valuable activities and people. These are the things that matter most, but often we allow less important matters to overtake our time and steal away precious moments. Weed out the things that keep you from achieving what matters most—the distractions, procrastination, and less important activities. When we spend our time chasing lesser things, we end the day feeling frustrated. We get the sense that our day was driving us, rather than feeling like we took control of the day. However, when we prioritize our tasks based on the things that matter most to us, we find that we move faster toward our goals, and have a greater sense of achievement. Each of us faces obstacles that impede our progress, or we get in our own way. Take some time to honestly analyze the obstacles that slow you down. Be aware of the things that have habitually kept you from reaching your goals. List those obstacles in your planner, and beside each item note what you plan to do to overcome it. This amazing practice often leads to life-changing goals. For example, if the lack of money is one of the obstacles impeding your progress, you may choose to create a budget to overcome that obstacle. Living within your new budget may allow you to pay off other debts earlier than you had anticipated. Determine what your future will look like with this goal accomplished. 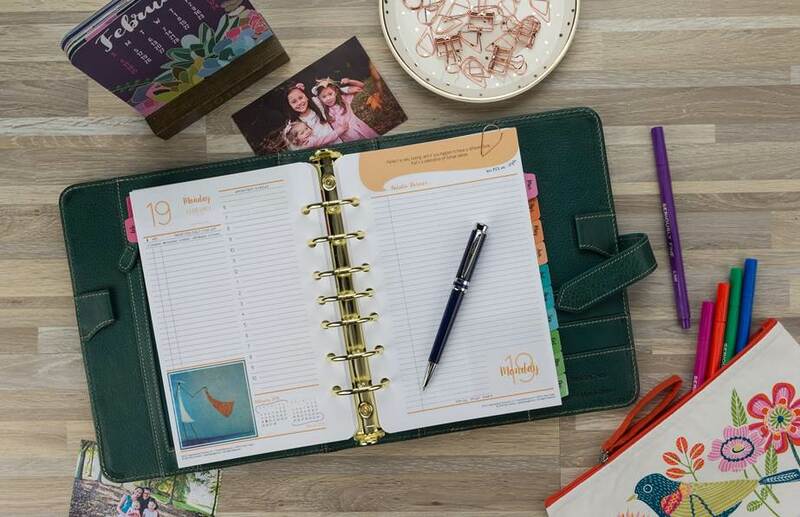 Write a statement in your planner describing the change you envision. Include a note about what it would look like without the change. Focus on the big picture to motivate your progress and keep you smiling when the work gets difficult. Your dreams are built one brick at a time. They won’t just happen on their own. If you have that vision always on your mind, you’ll appreciate the effort it takes to get there. With the vision of your goal in mind, consider the steps you will take to reach it. Write each step in your planner and break those steps down into activities that you can complete in a few hours or less each day. Use your planner to incorporate the steps into your daily routine. Write a note on your weekly or daily pages so you can keep the big picture vision always in sight. As you work through these four steps continually, you’ll see the growth you hope to achieve. Often that growth will begin much sooner than you ever thought possible. But whether your progress is fast or slow, if you work steadily on each step, you can plan on more satisfying days ahead. You’ll be in the driver’s seat of your life, and that’s a wonderful feeling.